The three California men who thwarted a terror attack on a French train in 2015 will make the rare move of playing themselves in a Clint Eastwood-directed film about their heroics, a studio announced Tuesday. 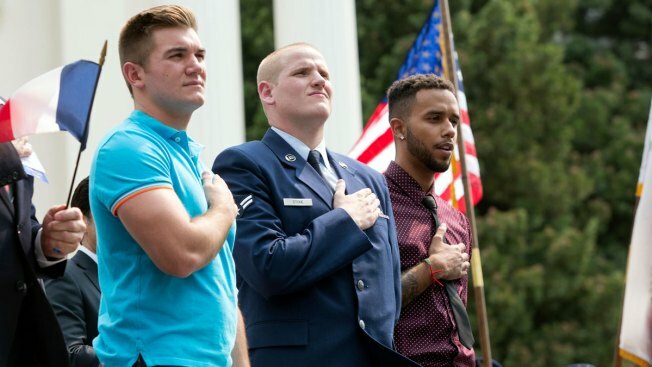 Airman 1st Class Spencer Stone, Oregon National Guardsman Alek Skarlatos and civilian Anthony Sadler, all childhood friends from California, will star in “The 15:17 to Paris,” a film based on the book they co-wrote about taking down a terrorist, Warner Bros. said in a statement. The film, which began production this week, follows the lives of the three friends from childhood to the evening when they helped subdue the man who opened fire inside a train traveling from Amsterdam to Paris. The film will be the latest of several about real-life heroes that Eastwood has taken on, including 2014′s “American Sniper,” and 2016′s “Sully.” But the leads in those films were played by Oscar-nominee Bradley Cooper and Oscar-winner Tom Hanks, respectively, not their actual subjects. It’s common to give cameo roles to the subjects of films that don’t require more than a line or two, but this case is nearly unprecedented in recent Hollywood history. There are no reports of the men having any acting experience, though Skarlatos appeared on “Dancing With the Stars” soon after the Paris incident. The studio’s statement did not elaborate on what prompted Eastwood and Warner Bros. to cast the men.